Team USA is holding a training camp in Seattle this week that culminates 7 p.m. Thursday with an exhibition game against China at KeyArena. Because she’s Sue Bird, the 37-year-old reigning matriarch of the USA Basketball women’s team, she must address two pertinent topics that will dog her until the day she retires. No. 1, how is your health? And No. 2, speaking of retirement, when do you plan to step away from the game? 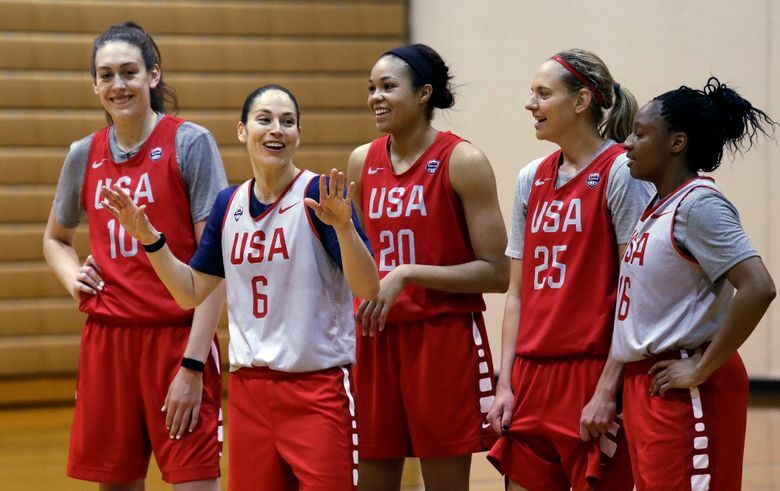 “So far, so good,” Bird said about her health Tuesday following the first practice during a three-day Team USA training camp that culminates 7 p.m. Thursday with an exhibition against China at KeyArena. A look at notable achievements by female athletes over age 35. • Tamika Catchings, 36, led Indiana Fever to WNBA Finals, 2015. • Lisa Leslie, 36, won her fourth Olympic gold medal, 2008. • Cynthia Cooper, 36, won the last of her three WNBA scoring titles, 1999. • Kristin Armstrong, 38, won her second Olympic gold medal in individual time trial, 2012. • Babe Didrikson, 40, was the leading money winner on the LPGA Tour, 1951. Three years later, she claimed her 10th and final major, winning the U.S. Open by 12 strokes shortly after surgery to treat colon cancer. • Nancy Lopez, 40, finished second at the U.S. Women’s Open, coming short of her fourth major championship by just one stroke, 1997. • Abby Wambach, 35, helped USA to a gold medal in the 2015 FIFA World Cup in Canada. Holds the world record for international goals (184) for both female and male soccer players. • Dara Torres, 41, won three Olympic silver medals, 2008. • Serena Williams, 35, became the oldest woman to win a Grand Slam singles title in the Open Era while capturing the Australian Open while eight weeks pregnant, 2017. • Merlene Ottey (Jamaica), 40, won an Olympic bronze medal in the 100 meters and a silver in the 4x100 relay, 2000. • Amy Acuff, 39, was third in the USA Championships in the high jump, 2015. • Jearl Miles-Clark, 36, won a gold medal in the 4x400 relay at the World Championships, 2003. • Sylke Otto (German), 36, won Olympic gold medal in singles luge, 2006. • Hayley Wickenheiser (Canada), 35, won Olympic gold medal in hockey, 2014. A year ago, the perennial Storm All-Star point guard missed the team’s training camp and the first two games of the WNBA season while recovering from arthroscopic surgery on her left knee. It was a minor setback for Bird, who averaged a career-best 6.6 assists and 10.6 points in 31 games while earning her record 10th WNBA All-Star invitation and helping Seattle to the postseason. Since the 2017 season ended with a 79-69 first-round playoff loss at Phoenix, Bird reprised the offseason plan she’s dutifully followed since 2015. During a three-month respite, she vacationed in the Caribbean and dabbled as a TV basketball analyst before returning to the court Dec. 1 and increasingly ramping up conditioning drills in preparation for her 16th season. Indeed, Bird is soaring into a place reserved for sports’ most durable stars, including Cal Ripken Jr., Martina Navratilova and Tom Brady. Bird is one of 19 players — including Storm stars Breanna Stewart and Jewell Loyd — attending the Team USA training camp at Seattle Pacific University this week. It’s the final tuneup for the 2018 FIBA World Cup held Sept. 22-30 in Tenerife, Spain. If Bird makes the 12-player roster — and there’s no indication she won’t — then it would be her fifth appearance in the FIBA World Championships. Staley teamed with Bird to win an Olympic gold medal in 2004. Staley was the sage veteran while Bird made her Olympic debut. Fast-forward 14 years, and Bird is the only point guard with Olympic experience in camp because Minnesota Lynx veteran Lindsay Whalen decided to retire from international competition. Finding Bird’s backup is one of the top priorities for Staley and the USA Basketball selection committee. The playmaking point guards in camp vying for a roster spot include Atlanta’s Layshia Clarendon and Dallas’ Skylar Diggins-Smith. And while we’re on the topic of retirement, Bird repeated what she’s been saying in recent years whenever anyone asks how long she intends to keep playing. “Right now I feel good,” Bird said. “I’m in this training camp. We got the World Cup coming and I’m down. And then we’ll talk in a year and I’ll let you know how I feel then. But make no mistake, Bird has every intention of playing in the 2020 Summer Olympics in Tokyo and becoming the first man or woman to win five basketball gold medals. “If I’m able and willing, absolutely I want to play in the Olympics,” she said. And maybe then, two months shy of her 40th birthday in October, Bird would close the chapter on a storybook career.